When news of a Jem and the Holograms movie that was looking for fan submissions to fill the cast as singers, dancers and more arrived nearly two weeks before April Fool's Day, we thought reported director Jon M. Chu (G.I. Joe: Retaliation, Justin Bieber: Believe) might be setting up an elaborate prank. But here we are almost an entire month later, and not only is the project real, but the four main roles have been cast, and a first look at the relatively unknown actresses in the roles has been revealed. With all the nostalgia for the 80s that has been heading to the big screen, we're not surprised, but this seems to be happening quickly. For those who don't know, Jem and the Holograms was a cartoon series from Hasbro, Marvel and Sunbow Productions that premiered in 1985, following the adventures of the titular Jem, the musical superstar alter ego of a young woman named Jerrica Benton who, with the help of a holographic computer called Synergy, is able to clandestinely perform rock concerts with her friends. 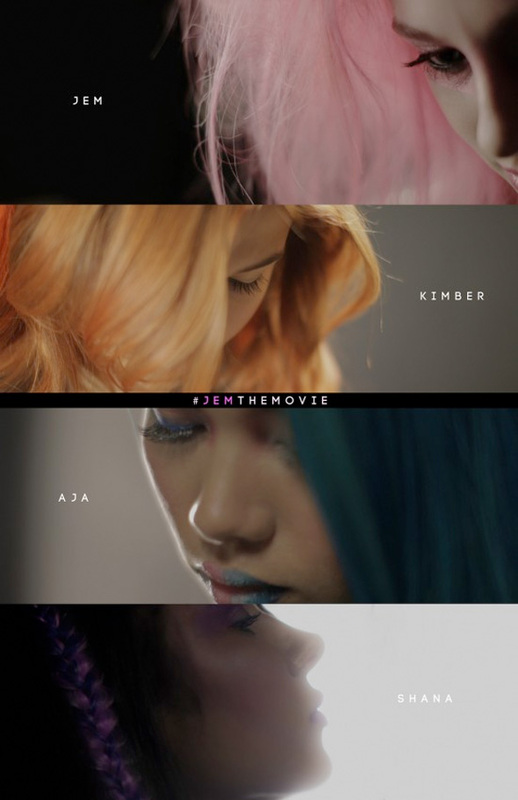 Above you can see the cast revealed by THR including Audrey Peeples (who had a role on "Nasville") in the lead role as Jem with Stefanie Scott ("A.N.T. Farm") playing her sister Kimber. Meanwhile the rest of the Holograms are Aurora Perrineau ("Pretty Little Liars") as Shana and Hayley Kiyoko ("The Fosters") as Aja. The film is already shooting, working from a script by Ryan Landels that focuses on an orphaned teenage girl who becomes an online recording sensation. She and her sisters embark on a music-driven scavenger hunt -- one that sends them on an adventure across Los Angeles in an attempt to unlock a final message left by her father. Is this destined to be forgotten like the Josie and the Pussycats movie that came after Scooby-Doo was a box office hit, or is there enough interest from the series fans to actually make this a fun musical adventure on the big screen? We'll see. Are you interested in Jem and the Holograms? You can barely see their faces....pretty lame marketing campaign so far. Who is their target audience anyway? 40 year old women who were kids in the 80s? Looked up Harold Perrineau on imdb... "He and his wife Brittany have a daughter, Aurora Robinson Perrineau" Gem + Mercutio's daughter, unless it's too 'tweeny' I might actually see this. So glad Chu dropped the ball on a follow-up G.I.Joe movie to make this instead. My only hope is that a better director steps in and improves the lackluster franchise. Here's the thing...if this is handled properly, this could be brilliant...both in the marketing aspects AND the movie. I LOATHED the show but this could really work as a movie if done right...if aimed towards an older audience and not teeny-boppers.. I think the trick to the movie has to be the music style. If they stay away from Miley/Brittany/Gaga music and instead go for a Grace Potter/Lorde/even early No Doubt sort of feel, it would work much better. I'd be very interested to see what sort of people that have hired to write the songs and music for this.